Barack Obama's love affair with Pittsburgh sports continued today, as it was revealed that he's picked the Pitt Panthers as one of his Final Four teams. No, he's not in the Mondesi Madness bracket (although it's not too late for YOU to join), he actually took time away from dealing with the disaster that is AIG to fill out a bracket for ESPN.com. While ESPN couldn't possibly reveal his entire bracket (that's being held for the noon Sportscenter on Wednesday), they did identify his Final Four selections: Pitt, Louisville, North Carolina, and Memphis. Someone's obviously not scared of Pitt's shaky tournament history. 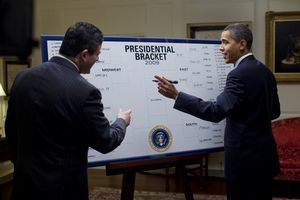 Obama's official bracket is now available to the public, and he's got Pitt falling to his eventual champion North Carolina in the Final Four. Oh well, it's better than the Sweet 16. "Look, I know picking these games is a silly exercise, and nobody really cares what I say anyway. Still, I put a lot of thought into who I announced as my championship pick on the CBS Selection Show. I was dead set on picking Pittsburgh for the last several weeks, but I got spooked by their loss to West Virginia in the Big East tournament. After checking with a source out in Pitt, I came to the conclusion that this team will actually benefit from having lost -- mostly because Levance Fields' sore back (which as you'll recall almost kept him out of the UConn game) needed time to heal. 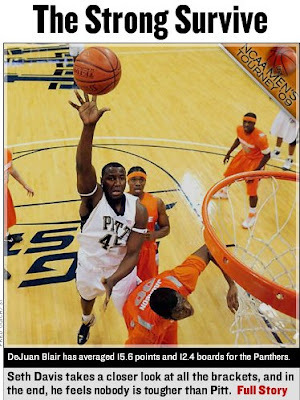 Remember, Pitt won the Big East tournament last year and lost in the second round. This may just be one case where a few days of rest and practice, combined with the healthy and humbling reminder that it can be beat if its not mentally ready, should be very helpful. That's my theory, anyway." Chalk another one up in the "losing early in the Big East Tournament is a good thing" camp. But for the reason he identified (getting rest for Fields), I can definitely buy it. One last Pitt note to pass along: if you've got HBO, keep your eyes peeled for the latest edition of Bryant Gumbel's Real Sports, which features a segment on none other than Jamie Dixon. It is entitled "Bittersweet Success" and covers Dixon's rise to prominence while simultaneously dealing with the loss of his sister, former Army women's coach Maggie Dixon. Knowing Obama, all tourney pool winners will now be taxed. Gotta pay for those AIG bonuses somehow, right? I'm ok with Obama picking Pitt, he picked the Steelers to win the Super Bowl and that worked out pretty well for us. did coach dixon give obama the game ball after they beat uconn?